KIGALI, Rwanda, Sept 25, 2015 (The New Times) -- East African ministers will, next month, head to Beijing for the annual Africa Power and Infrastructure Forum (AIPF) where they are expected to attract more Chinese investors into financing regional projects, including the proposed multi-billion dollar standard gauge railway. In its fourth edition this year, the forum is being organised by EnergyNet, an online oil and gas auction platform, in partnership with the China-Africa Development Fund formed in 2006 to support Chinese companies to develop investment partnerships in Africa. The fund currently has some $5 billion under its management and its handlers will be offering part of the money to African countries with attractive projects that require private investor financing. According to the organisers, more than 10 project proposals will be presented during the forum which takes place from October 15-16. The forum is expected to attract several Chinese investors looking for juicy investment openings at a time when China's economy is experiencing a downturn due to structural reforms. Rwanda, Uganda and Kenya are to each send a minister to jointly market the standard gauge railway (SGR), an important infrastructure venture aimed at facilitating regional trade along the Northern Corridor. 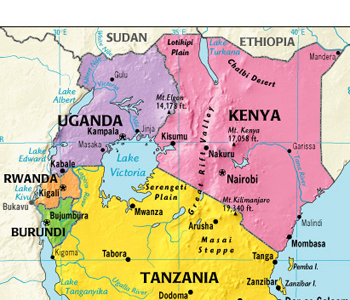 The New Times understands that East Africa's lineup in Beijing will feature Rwanda's Minister for Infrastructure James Musoni, Uganda's State Minister for Privatisation Aston Kajara and Kenya's Treasury Cabinet Secretary Henry Rotich. Rwanda's Infrastructure ministry, when contacted yesterday, couldn't readily confirm whether Minister Musoni will attend the forum but Permanent Secretary Christian Rwakunda said China has already agreed in principle to bankroll the venture from Mombasa to Kigali through Kampala. Construction of the first leg of the SGR from Mombasa to Nairobi in Kenya is already underway and Rwanda recently sent its engineers to the site to acquire skills and expertise ahead of works on the Kigali section. In May, a joint ministerial committee appointed by heads of state from Kenya, Uganda, Rwanda and South Sudan toured the site to have a sense of the progress and they were reportedly impressed by what they saw. At the forum next month, the team from East Africa will be gearing up more morale from Chinese investors in preparation for the other sections of the railway whose construction is yet to start. But as they market the SGR, East Africa's Ministers will have to jostle ministers from other parts of Africa to catch the attention of Chinese investors in a bid to have a piece of the $5 billion available with the China-Africa development fund and other potential funders. Africa is not short of bankable projects and East Africa's SGR is just one of them; the Chinese will also hear about other potentially lucrative ventures such as the Gas-to-Power investment opportunities in Mozambique and South Africa as well as Ghana's dry-port development. All ventures are potentially lucrative but require large scale investments to implement and governments are keen on attracting private money to enable a public-private financing. Africa has been a major beneficiary of Chinese fast growth in the last three decades as the world's second largest economy guzzled up raw materials from the continent to fuel its industries something that boosted global commodity prices. Chinese growth in the past decades also gifted African countries with investment and infrastructure funding deals worth billions of dollars which helped create thousands of jobs across the continent and boost growth. But next month's forum will take place at a time when the Chinese economy is easing into a light jog after decades of sprinting. From 1978 to 2005 when Chinese economic reforms started, the China has mostly enjoyed double digit growth with a high GDP average of 9.6 per cent over the period; then, the Chinese economy was only fourth, behind the US, Japan and Germany. In 2008, when the global economy went into recess and shattered most developed countries, China managed to record an unbelievable growth of 9.6 per cent and 9.2 per cent the next year. Then in 2010, China's GDP expanded by 10.6 per cent and elbowed Japan to become the world's second largest economy after US. The same year, Japan's growth was a measly 4.7 per cent. But since 2011, China's economy, although still one of the fastest growing in the world, has visibly been steadily slowing down. It's a development that Chinese leaders attribute to a deliberate structural reform of the country's economy and the slowdown is only an early reaction. The numbers show that China's growth has reduced from 9.5 per cent in 2011 to 7.7 per cent in 2012 and remained unchanged in 2013 before dropping further in 2014 with 7.4 per cent growth, the lowest since 1990 when it GDP expanded by 3.9 per cent. In the first half of 2015, between January and June, China's economy grew by 7 per cent but growth is projected to drop further to at least 6.7 per cent in 2016, according to projections by Organisation of Economic Cooperation and Development (OECD). The slump in China's economic growth, according to many global economy commentators, is expected to have hard hitting effects on African economies most of which owe their growth in recent decades to China's own fast growth. However, last week, Chinese Premier Li Keqiang moved to calm those fears and reaffirm confidence in his economy when he told entrepreneurs attending the Summer Davos Forum in Dalian that China's economic situation "has ups and downs, but the trend remains positive." "As long as we have relatively sufficient employment, increased household income which is in step with GDP growth and a constantly improving environment, such a rate of development is acceptable," Li said. From his assessment, China seems to be ready to accept and embrace lower but stable growth but the rest of world including Africa that has been accustomed to a 'fast China' must also get used to the new Chinese economic reality. In the first half of this year, China's surveyed urban unemployment rate was about 5.1 per cent and the economy reportedly added more than 7 million urban jobs in the first six months of 2015. "The overall economic trend is positive although there are also difficulties to overcome because we are pressing hard ahead with structural reform to advance structural adjustment," Li said, adding that during the process it is only natural to see fluctuations in some of the economic indicators. Looking to China for progress? The ministers from East Africa are expected to be joined in Beijing by their African counterparts, including Obeth Kandjoze, Namibia's Minister of energy and mines, Henry Macauley, Sierra Leone's minister for energy, Zambia's energy minister Christopher Yaluma and Matadi Atadi Nenga Gamanda, DR Congo's minister for energy and water.